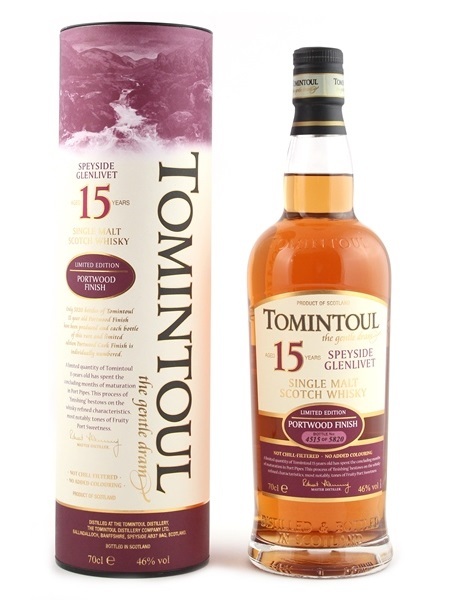 Tomintoul distillery was founded in 1964 in Speyside. Since 2000, it has been in the ownership of Angus Dundee. The vast majority of the whisky produced there makes its way into blended Scotch. It is therefore unusal that it releases so many age statement expressions under the Tomintoul single malt brand. There is a 10, 12, 14, 15, 16, 21 and 25 to name a few. They also make peated whisky for a couple of weeks of the year. This 15 year old Tomintoul single malt was matured in ex-bourbon barrels, like most of their single malts, but given a finish in Port pipes. Known as "the gentle dram", it's non-chill filtered, natural colour and bottled at 46% ABV.